Enabling Cookies in iPhone is an important choice a smartphone user has to make as many websites these days tend to require cookies to store important information about you. A typical use case of cookies in iPhone is to store your username through cookies so that the iPhone can remember you next time you visit the website. Note that cookies are also used to target relevant ads to you. Remarketing is a great use case of cookies which allows advertisers to drop cookies when you visit websites and target you across the web with relevant and highly-targeted ads. However, if you noticed your iPhone is not accepting cookies you can enable cookies in iPhone by following the few steps outlined below. 1. Search for the Settings icon in your iPhone. The icon looks like this . It is typically located in the home screen and has a gear icon. 2. Tap on the Safari option found in the Settings page. 3. If you have not enabled cookies in iPhone, the status next to Accept Cookies will be Never. Since you want to enable cookies in iPhone, tap on Accept Cookies. 4. You will be presented with 3 options. 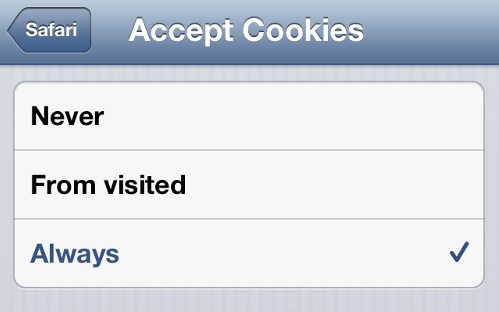 Never, From visited, Always are the various cookie options in Apple iPhone. 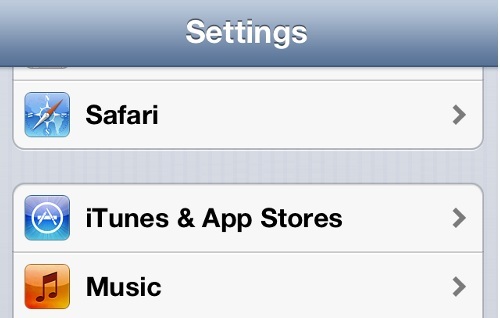 To enable cookies in iPhone, choose Always and tap the Safari back option. 5. You can verify that you have enabled cookies in iPhone by checking that the status of Accept Cookies is Always.